They give lessons so check out their programs! Young or old, any age is a good age to learn to mountain bike! DH Trail – A step up on difficulty from Upper J-Bar, you’ll find detailed rock work along this steep, challenging trail. 2/3 --- But they are neighbors to a 5/5; Kingdom Trails network! Burnham Down – Two-way connector to East Burke Village, single track and bridges! The trails I love, the lift makes it easy to lap these 7 trails, which all start from mid mountain. Three of the 7 include excavated trails, 2 of which are quite wide. During closed hours these are available to Kingdom Trails season pass holders. Knightslayer – An awesome freestyle run with a bit of everything fully excavated. This trail includes; drops, jumps, a wall-ride, hips, step-ups, bridges, step-downs and berms! All jumps are either optional with a ride around or you can ride over them completely. Roly Grail – A beginner trail with a lot of rollers and berms. This doesn’t mean an expert rider won’t have fun on this trail, there are hidden ninja lines you can find, and you could always double some rollers and pin those berms with awesome amounts of speed. Jester – Berms, berms, and berms! If you love a speedy trail and pinning berms with speed I’d recommend this trail. There are many ninja lines in this trail, for the first section you don’t have to hit a single berm. Everything is roll-able except the final feature which is a wooden drop; there is of course a ride around option. Black Forest – A single track trail with some flow and tech, this trail has roots and rocks but is known for its extremely muddy conditions after a rain….. 3 days ago, this trail is normally slick but don’t get me wrong it is a good time! Enchanted Forest – Classic single track with roots, bridges and berms in all the right places, the trail crew tried to make it so you can carry your speed through the trail instead of braking for those pesky hair pin turns. Drawbridge – This trail connects you to Lower J bar, which loops around and back to the end of Black forest, this trail mimics the Upper J-Bar but with a lower difficulty. 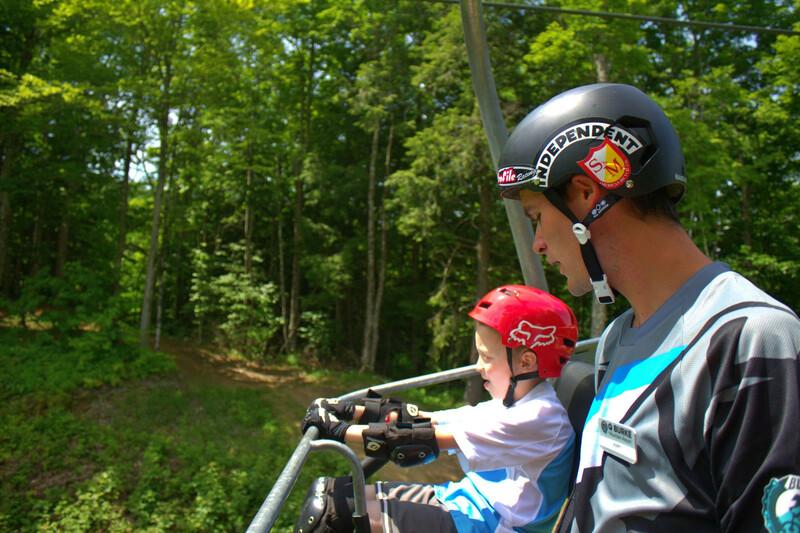 Overall, the mountain does have a bit of everything and can accommodate beginner/intermediate to expert riders. They do need a skills park for the early or even late learners to the sport of mountain biking. While they are adding things, I’d personally like to see: Dirt Jump Park with jumps ranging from beginner box jumps to expert doubles, a pump track ranging from small lines, little kids can have fun rolling over, to large roller sections people can double and manual through. They have fun freeride excavated trails with a range of features, but it never hurts to add more. Options are key, with larger and/or smaller features so people have something to work up from if they are learning. Oh and they could also add another tech trail to get you ready for the summit trails, because there is a large gap between the lower and upper mountain. So, like I mentioned, they have a lot of room to grow and I am sure they will soon, with such endeavors as the large hotel they are putting in will surely attract guests to the resort. QBurke is a nice family place to stay even if the whole family is not into the outdoor sport of mountain biking they can still stay on site as the dad and son or mother and daughter hit the trails. I enjoy riding there every weekend, I am always finding something different to do on each trail making my ride a very personal experience, from little rocks and stumps I launch off to my favorite ninja line through the woods. I’ve had the luck to have this park in my backyard during the four years I’ve spent attending Lyndon State College! Pros: Right next to Kingdom Trails. Cons: Wish the chairlift went all the way to the top of the mountain!